Here, beautifully illustrated and presented in both English and Japanese, are 12 of the best Japanese folktales — shared with generation after generation of Japanese children. These charming tales engage your imagination as you’re carried on turtle-back rides, brought to the underwater palace of the dragon princess, and discover a temple with a "tea kettle" that is really a cunning badger in disguise. These stories are all richly illustrated, with 98 full-page color illustrations by two of Japan's foremost children's books illustrators. Executed with great skill and imagination, they bring to life the charming characters of these heartwarming tales of old Japan. The tales were originally written in English by author Yuri Yasuda based on her interpretations of traditional Japanese stories. Here they are fully bilingual — each one accompanied by Japanese text. The Japanese text includes basic kanji and furigana to help learners begin to recognize the characters. 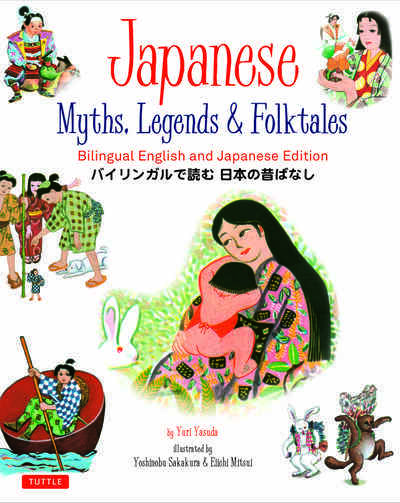 Japanese Myths, Legends and Folktales is accessible to both young English and Japanese audiences, as well as language learners who wish to enhance their abilities. This multicultural children’s book will entertain, inspire, and educate in equal measure.